While residents of the Upper East Side continue to fight the opening of a rebuilt Marine Transfer Station that would handle some of the island’s waste it still doesn’t address the underlying problem of too much trash. New York City’s current day-to-day approach to trash – shipping most of it elsewhere – is not fundamentally sustainable. The more than 10,000 tons or greater of commercial waste generated every day is taken by private carters, both directly to New Jersey and to waste transfer stations in the other boroughs for shipment to out-of-state landfills. The basic philosophy behind the Solid Waste Management Plan, that includes the marine transfer stations, is to establish a more equitable -and less impactful- waste processing system, with infrastructure in every borough. Opponents argue that while there may be less trucks on the road this plan will not contribute to a more environmentally sustainable waste management system in New York City and that the City should be focused on reducing the actual waste stream, and not on large capital projects. According to the city’s Independent Budget Office (IBO), this proposal will triple the cost of waste management for the city. The IBO estimated that the waste management costs per ton at a new facility proposed for the city’s Upper East Side would be $278 in its first year of operation, 2016. 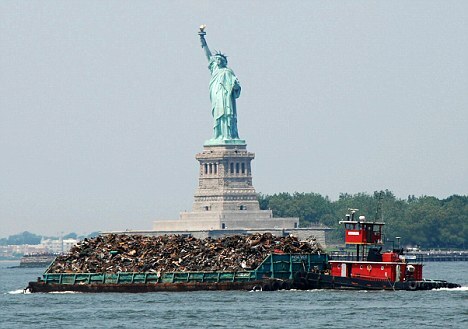 The current interim plan of shipping waste to transfer stations in New Jersey and Yonkers, N.Y., is $93 by comparison. The higher cost per ton for the marine transfer station is due primarily to “the more costly multimodal method of transporting waste from transfer station to its final destination via barge and rail. The Department of Sanitation is continuing the Bloomberg administration’s late-term efforts to expand what is recycled in the five boroughs by introducing organics recycling but at what cost? This entry was posted in Environmental Concerns, News and tagged BioHitech America, NYC Marine Transfer Stations, Organics Recycling on November 24, 2014 by Lisa Giovannielli. Supermarkets are significant contributors to the 34 million tons of food wasted each year. The disposal of food waste is a complicated and costly process. In addition, with cities and states passing legislation to restrict the amount of food waste being sent to landfills, facilities subject to these regulations need to quickly act on a solution that is cost-effective, environmentally-friendly and compliant. In an effort to reduce waste sent to landfills and to limit the amount of harmful methane gasses emitted, many people turn to composting as an alternative. However, this is not the most viable solution for a few key reasons. Composting carries many challenges including rising costs, carbon emissions while transporting waste, on-site storage logistics, labor and the inability to accurately measure waste. There are two alternative food waste diversion technologies that are becoming popular in the marketplace, aerobic and anaerobic digesters. These solutions help to eliminate the negative environmental factors and are smart investments for companies that produce large amounts of food waste. Aerobic digesters have been developed to eliminate food waste on-site at its point of generation. They accelerate the natural decomposition of food waste converting it to nutrient-neutral water that is transported safely through standard sewer lines. Many aerobic digesters run using a continual process, enabling waste to be added as needed with nothing left to haul away. This is currently the most cost-effective and environmentally friendly option in the marketplace. What makes aerobic digesters a more efficient alternative is that they minimize the logistical effort needed to dispose of the waste. The next step is to incorporate real-time quantification and transparency of food waste volumes. For example, some on-site aerobic digesters provide users the ability to determine where and when waste is produced rather than relying on assumptions. Data is crucial in reducing food waste and managing efficient operations. Other parts of the world are capitalizing on the positive impact of anaerobic digesters which break down waste and convert it into an energy rich biogas. A supermarket chain in the United Kingdom is using its food waste to cut off completely from the grid powering the supermarket’s lighting and refrigerators without the need for fossil fuels. While anaerobic digestion is a forward thinking option, it is scarce in the United States because it is an expensive undertaking. However, I do foresee this becoming more widespread as the U.S. has a strong desire to achieve energy independence. Food waste companies need to continue to evolve their technology in order be able to provide customers with an effective means of generating anaerobic digester feedstock without losing the on-site nature and data analytics of aerobic digesters. We are currently piloting projects with leading anaerobic digestion companies to offer consumers a viable food waste management program that will provide the benefits of both aerobic and anaerobic digestion. This entry was posted in Technology and the Environment and tagged Aerobic Digestion, BioHitech America, Eco-Safe Digester, Food Waste, Transparency of Waste Data on November 6, 2014 by Lisa Giovannielli.